The year-round warmth alternative comforter has hypoallergenic, polyester fill which provides relief for those with allergies to natural filled bedding. The comforter is encased in a luxuriously soft 44 thread count cotton shell and is designed with box stiching to prevent from shifting. Corner loops are sewn in to keep your duvet cover in place. 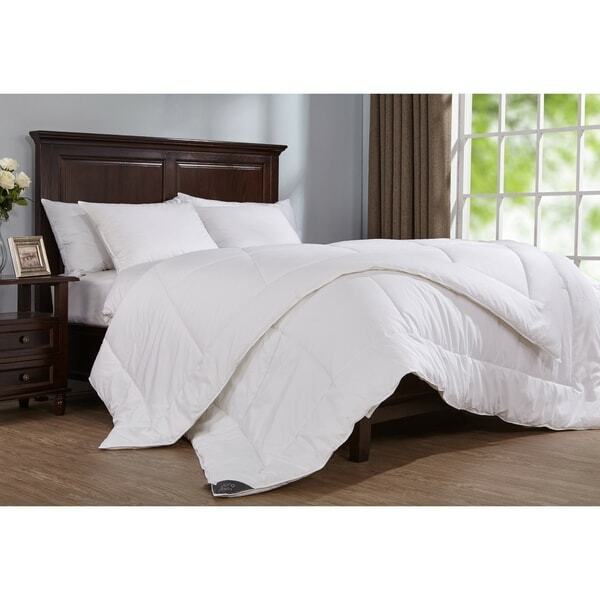 Comforter is made from 400 Thread Count 100% Cotton, dobby check with stain release. Filled with 100% polyester fiber. This item is machine washable; however, please make sure equipment is large enough to allow the item to move freely in wash. Made in China. Dimensions 98.0 In. X 90.0 In. X 3.0 In.